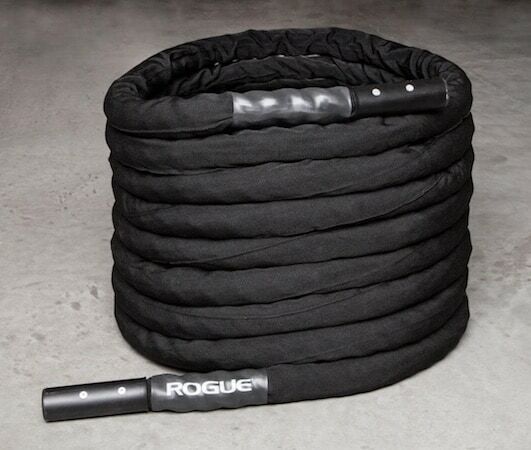 The battle rope started its life as a piece of workout gear for martial artists. Today, it’s used by more and more athletes in a variety of sports. This is thanks to its unique advantages and sheer versatility. 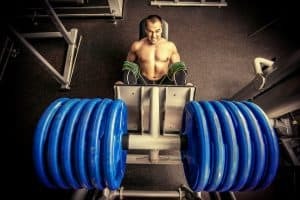 Not only are they fun to use, they can integrate nicely into almost any form of training as a powerful tool for conditioning. 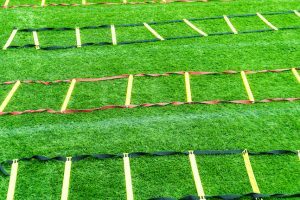 This includes endurance, stability, explosiveness, power, agility, footwork and a plethora of other types of workouts. Battle ropes are now commonly used by boxers to practice specific techniques like blocking, hooks, crosses and uppercuts. With a good rope, you can not only target specific parts of your upper body, but also activate muscles that are often much more difficult to train with other equipment. Its versatility makes it a must-have in any athlete’s home gym or training space. So, if you’re in the market for a good battle rope, we’re here to help you make the best possible decision. In this article we look at the best battle ropes you can pick up right now. Rep Fitness’ take on battle ropes comes in the form of a 100% pure polydacron weave for the best feel and a smooth, wave-like action. They’re available in a variety of colors and feature a nylon sleeve in the middle for added durability. The grips are heat-shrinked, which not only makes them more comfortable to hold, but also keeps the weave tight. The v2 Battle Rope is available in lengths ranging from 30ft to 50ft, with 1.5″ and 2″ width options available for each. Polydacron makes for a soft, comfortable feeling when you work the rope. However, it does wear out faster on rough surfaces than some other materials. Luckily, Rep Fitness offers a 1 year warranty with free replacements. 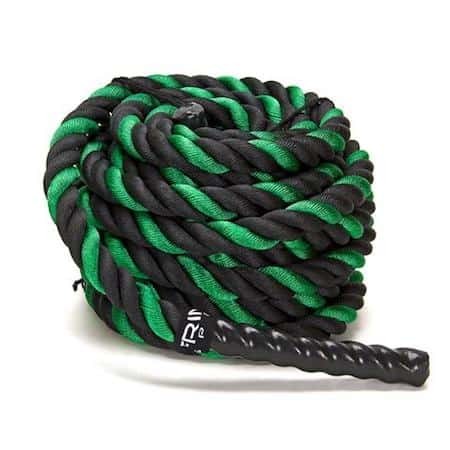 Unlike most other manufacturers, Onnit offers a 2.5″ version of their battle rope alongside the more standard 2″ and 1.5″ diameters. The 2.5′ version is also available in a 50 foot option. This makes for one serious rope that would initially appear imposing to most athletes. However, Onnit’s ropes are crafted to be as soft and flexible as possible while still being able to take a beating. They’re available in a variety of unique designs, including a branded Spiderman rope. The unique plastic grips are comfortable and the material is weaved together tightly for minimum fraying. 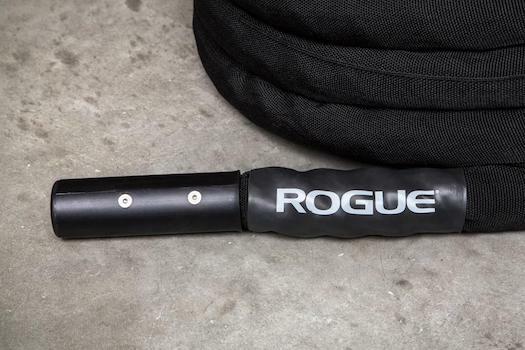 If you insist on having the very best, or simply plan on giving your ropes an absolute beating, look no further than Rogue Fitness’ rendition of the battle rope. As with most of their products, the Bulldog is made in the US. Polyethylene is the material of choice and it’s wrapped in a nylon jacket for unrivalled durability. The rope is also covered in their Bulldog Collar, which prevents any fraying or shedding. Perhaps most impressive of all are the anodized aluminum handles, which are not only more durable, but will also stay cooler over long sessions. 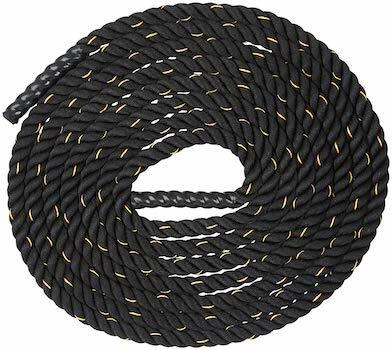 A 90 day warranty comes standard for this 1.5″ wide, 45 foot long rope. Just like most Basics branded products, Amazon’s battle rope provides unrivaled value for money. A standard selection of 30, 40 and 50 foot lengths are available in both 1.5″ and 2″ diameters, ensuring there’s something for everyone. 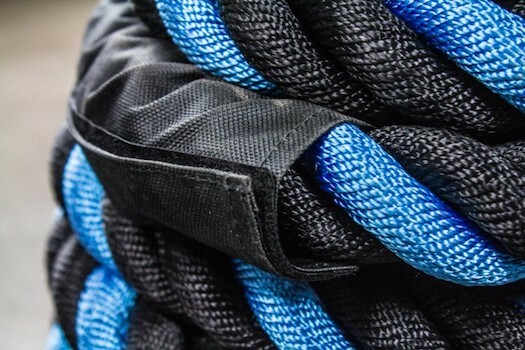 The high tensile strength, 3-strand polyester blend weave is not only strong enough for traditional battle rope use, but also pulling and climbing exercises. Heat-shrinked grips come standard for increased weave strength and a comfortable hold. 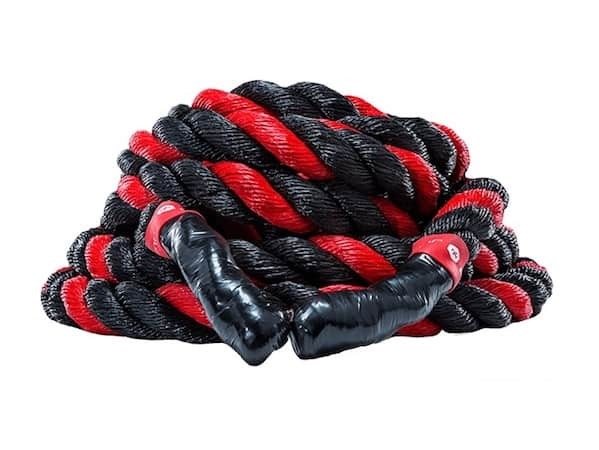 Free shipping through Prime adds even more value to this already affordable battle rope. 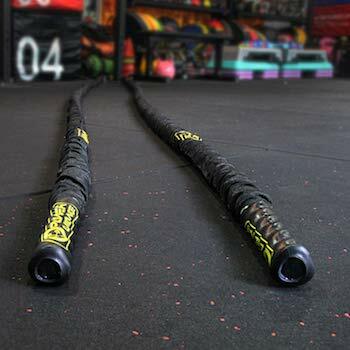 A durable poly-synthetic fiber weave makes up this 50 foot long battle rope from Fringe Sport’s inhouse brand, OneFitWonder. 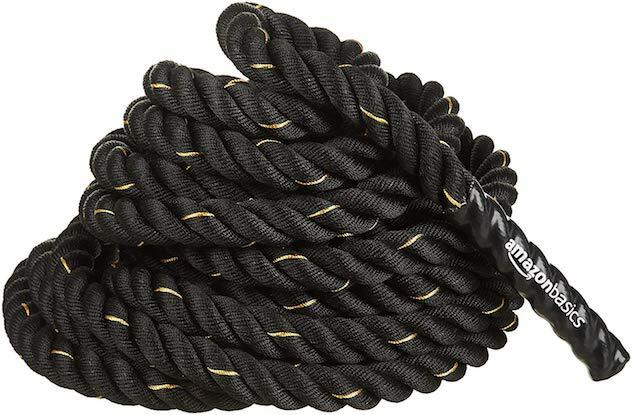 Two versions are available – a 1.5″ wide rope weighing in at 28 pounds and a heavier, 53 pound, 2″ variant. The rope ends are dipped and sealed onto the material for minimum fraying and a comfortable grip. 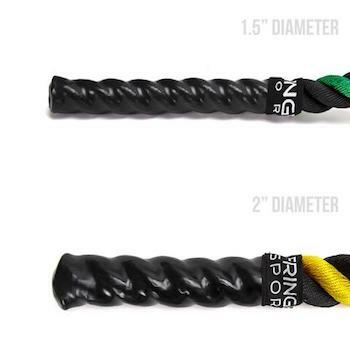 Despite its excellent durability, Fringe Sport includes a one year warranty with each rope for extra peace of mind. A soft and flexible build material makes the OneFitWonder ideal for any type of workout. And if you don’t live near Austin, TX, you can also take advantage of free shipping. 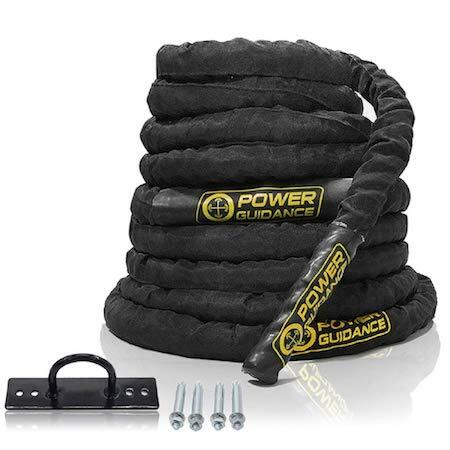 Unlike most battle ropes, which have their weave exposed, the Power Guidance battle rope is covered in a nylon sleeve. 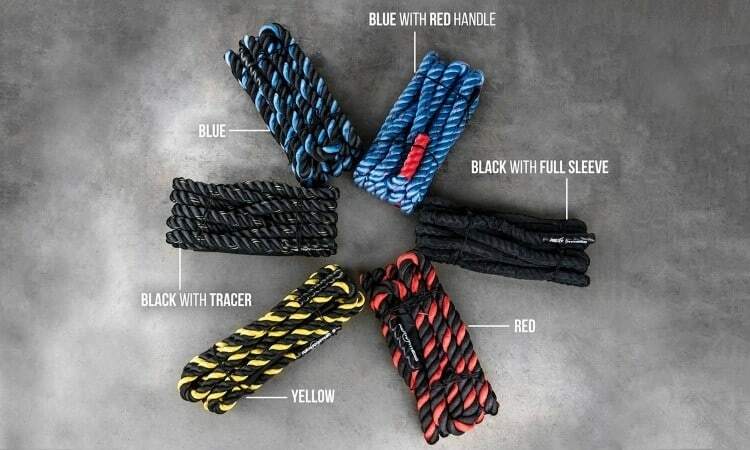 This adds years of usage to your rope by protecting it from friction and subsequently eliminating any fraying or shedding. Heat shrink handles can be found at the ends of the Dacron weave, which contains PolyPro and PolyDac materials for maximum durability. Power Guidance has also included a battle rope anchor that you can nail into a surface of your choice for a variety of workouts. It’s available in 30, 40 and 50 foot lengths and measures in at 1.5″ thick, making it ideal for experienced athletes and beginners alike. As with any fitness product, not all battle ropes are created equal. There are numerous design features that need to be considered before you make your purchase. Here are the most important. When it comes to material, synthetic weaves are the way to go. This is namely due to their superior strength. Natural materials such as Manila tear easily, leaving strands of material lying around after each use. If you plan on training outside or simply want something that will last, ensure that the rope you buy is also water resistant. Length and width is another important factor to consider. Shorter ropes are more suited towards quick, explosive workouts. Longer ropes are of course heavier and demand more strength to be fully worked. In the same light, wider ropes (around 2″) are more demanding. This is not only due to the added weight, but also the larger diameter – which puts more strain on your forearms as you grip the rope. Thinner (1.5″) ropes are suitable for beginners, along with being better for more intense workouts and cardio. So you’ve just bought the best rope on the market. Now, you may be wondering where to start. After all, there’s an endless list of different exercises that you can perform with a battle rope. Here are three simple and effective beginner workouts that will get your blood pumping. 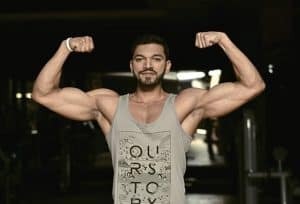 This is that impressive workout that you see on every television advertisement and gym poster. Simply stand in a near-squatting position and raise and lower your arms one after the other until you get a wave-like rhythm going. Who knew looking cool could be so simple? Take this timeless exercise and spice it up with your battle ropes for a workout like no other. Start in a narrow squat position while holding each end of the rope in the respective hand. Then, perform a jumping jack how you normally would with your legs, but swing your hands out to the sides and over your head before landing back in a squat position. Repeat quickly. If you want to look like the God of War taking on his next enemy, this is a pretty good way to go. In the same position as you were in the alternating waves exercise, raise your arms above your head towards one direction and then slam them in the other, creating a ripple in the rope as you do so. Well, there you have it: The Best Battle Ropes currently available. 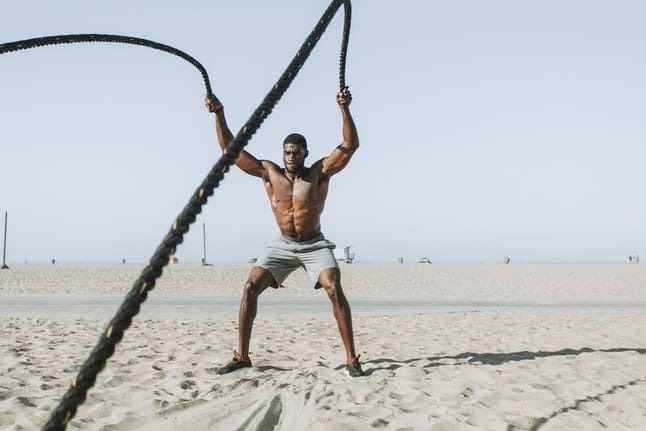 No matter whether you’re a swimmer, runner, fighter or cardio freak, battle ropes will prove to be a valuable addition to your training arsenal. Use them as a learning experience and figure out which exercises work best for you. Before you know it, you’ll be making waves and slamming the ground like you’re in a Rocky movie.